I told a man I used to work with a long time ago that I tried, as far as possible, not to have regrets about the decisions I made; that I tried to understand at the time why I made decisions I did. This doesn’t prevent regret of course, but it does provide understanding. One of the things I did over the last 9 months was start drawing and sketching. I’m not entirely sure what enticed me to do it, apart from realising that a couple of my coloured pencils were watercolour pencils and that possibly, it might be within my scope to produce paintings without having some of the problems that I have painting. Drawing with pencils is somewhat easier to me. And I’d emphasise the “somewhat” there. I’ve always taken photographs, and if you look to the right, you’ll see a selection of photographs I’ve taken over the last, I suppose, 10 years or so. One of the things I noticed over time is I was spending more time in system administration, taking photos off cameras, processing them, printing them, selecting them for print, for upload and a lot less time actually out taking photographs. Over time, I found that demoralising and started taking fewer and fewer photographs with my large photographic equipment. Along the journey of looking at painting and watercolours – which you wind up doing if you’re interested in watercolour pencils because there tends not to be much useful about watercolour pencils – I came across travel journals. Beautifully illustrated watercolour travel journals which capture the essence of place; very often with a commentary. I’ve kept a personal journal for more than 20 years now and here and there, I’d have liked to be able to put drawings into them. I just never felt able to. I was never good at art, to be honest. I’ve written pieces about that before so I won’t go off on too much of a tangent on that front. Only that, I learned at a very early age that art was a talent and either you have it or you don’t. I’ve learned that this is a lie. In much the same way as either you’re good at maths, or you’re not, or you’re good at languages or you’re not. Somewhere along the line, art fell into the box of things I wasn’t good at. It’s not, I suppose, that it didn’t come easy to me, only that it didn’t really come easily to my teachers either. In truth, I should have known this is a lie. Most things depend more on effort than innate ability. Innate ability takes you nowhere if you don’t nurture it. The problem for me, at this point in my life, is that I truly regret this. I’m not sure how to deal with it because in certain respects, it’s very easy to make a decision not to do something if, as a child, it’s been made clear to you that this is not where your talents lie. My talents actually lay everywhere else so no doubt, no one found it surprising that I wasn’t great at something and fortunately, that something wasn’t important. At this point, I’d like to list all the places I’ve been. Some people have been to a lot of other places too but I don’t think that’s a bad haul. And I have photographs from a lot of them. The thing is, the way I take photographs is different, now, to the way I draw. In an ideal world – and I never made a decision not to do it for the simple reason that it never even occurred to me it was possible – I would have a library of journals, not unlike the written journals I have, with pictures from these places. I was in Berlin in 1992, for example. That’s a very short time after the wall came down. I haven’t been back since and don’t even ask me where the photographs of that trip are. I could colour my life with the regret of missing out on drawing what the Sahara desert looks like. Or missing the opportunity to draw Sydney Harbour Bridge (although I did actually climb it at the time). Or I could move forward with doing it in the future. I have an art journal here beside me; the first one, and it has been under production since end February I think. It’s coming to a close as I’ve almost filled it. I have another one of a similar size, although different paper, lined up. 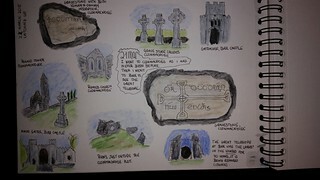 This is an example of some sketches following a trip to Clonmacnoise, for example. I clearly have a lot to learn about what I am doing in terms of laying out these things, best tools and stuff. I haven’t really settled down on the best paper yet (this is an ongoing issue, sorry. I’ll shut up about it). And photographing them effectively. But the point is, they open doors to a memory in an entirely different way to the way photographs do. So yes, I’m sorry I don’t have a collection of these from the last 20 years of travelling, to such an extent that I will probably put together a Memories of Travelling Journal based on whatever photographs I can find of these places. It’s cheating in a way. When I paint that coloured building in Nice, it won’t have been when I was there. Mostly these days, I take reference pictures on my phone, unless I’ve time to sit down and sketch for a little while, in which case I’ll generally work off the sketch. Of course, 10 years ago, it would have been sketch or nothing. I work in technology at the moment. I’ve a lot of opinions on that, not least the fact that nearly everyone I know who works in technology has a hobby that is about as artisan as they think they can get away with. Be it coffee, be it craft beer, be it wood turning, be it collecting old toys. I suspect that there is some deep rooted desire to do things a little less virtually. My guess is part of the painting came from how technologically driven photography became over time. I think that’s why I started looking at drawing. I’ve learned a lot about art over the last 4 or 5 months; mostly that it offers serious options across the board in terms of techniques and tools. I always had a relatively narrow view of art, again, I suppose, linked to early schooling issues with paints. I now see that there are things I can do with coloured pencils which might never have occurred to me, things I can do with graphite pencils, and pens which never occurred to me. In a way, it’s a fabulous new world, full of opportunity. Mind you, when I am dead, someone is going to have to decide what to do with these things.